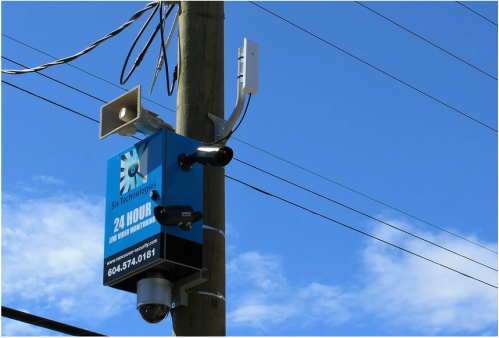 Six Technologies Inc is one of the few companies in British Columbia able to offer real live video security monitoring from a ULC Listed Monitoring Station. Our services are not "event based" but have an actual, highly trained, agent protecting your employees and property. This agent is able to immediately verify an event taking place and with our optional one or two way voice communication they can even possibly prevent the crime from happening. We believe deterrence is the best form of security there is, and the best way to deter any type of unwanted activity is through a pro-active approach. 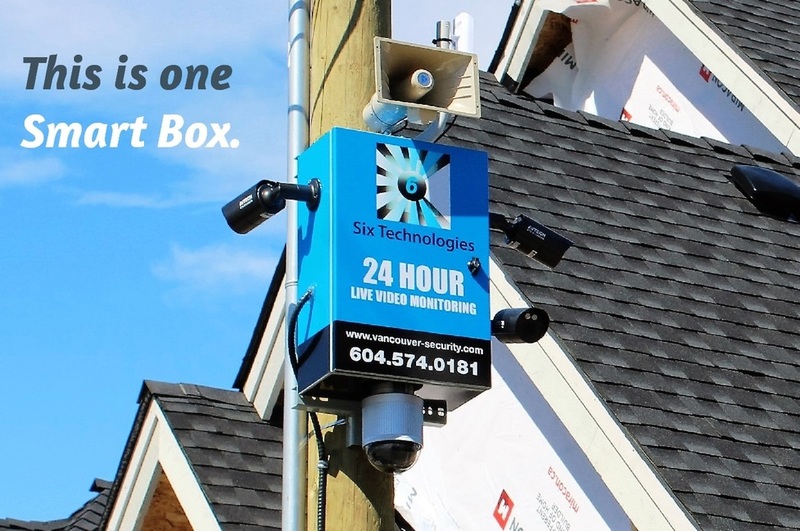 Our Smart Boxes are your best choice for protecting construction sites, car dealerships, farms, rural properties, warehouses, parking lots, shopping centres, new home construction sales centres, and storage yards. Our Smart Boxes are custom made by us to meet the individual needs of our customers. They feature Full HD 1080p IP Cameras that can be transmitted over long distances to ensure you site gets the coverage it needs. 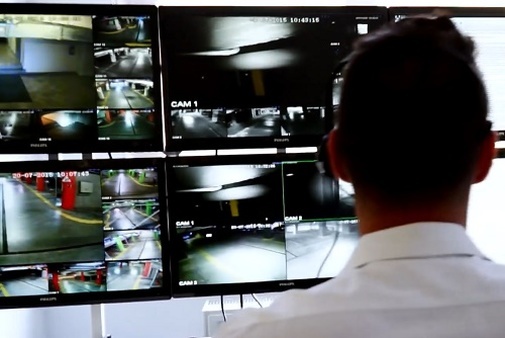 All of our Smart Boxes are monitored by highly trained security agents in real time where they can communicate with local security or law enforcement immediately upon observing any criminal activity. Some of our competitors are still using low definition Analog Security Cameras, they are simply not good enough. Our Smart Box HD Rental Systems are state of the art and capture 1080p HD video evidence of a crime. 1080p sample footage from outside our retail store in Cloverdale BC. Most Video Monitoring companies rely on "software analytics"or motion detectors to monitor your site. What this means is that they are waiting for an event to trigger a signal to the monitoring station, then an employee will bring up your camera, as soon as they are available, and have a look. This is assuming of course that the sensors or analytics have picked up the event in the first place. The issue with this system of monitoring is that it is reactive. Too much time has past since the event for this to be truly effective. The criminal may have already passed by and may now be out of camera range. The agent then has a choice, review past footage to see if it was a false alarm, or check other cameras to see if they can locate what set off the event. Our approach is different. We want to prevent an event by using a proactive approach. We want to engage using live audio to deter the subject before they are even entering the property. How can we do that? Our Live Video Monitoring Agents are watching your cameras live. They can see the subject and communicate before they climb that fence, break in that door, or smash that window. How can there be only be 2 Police arrests in hundreds of thousands of hours of monitored video? It's all about deterrence. ​We work with our clients to implement a professional system. ​By focusing on correct camera placement, lighting, high visibility signage, HD 1080p cameras, and the use of sirens and strobes we are able to deter would be criminals from entering the area. In addition to our monitoring agents watching your cameras, we give our customers access to their systems from anywhere. 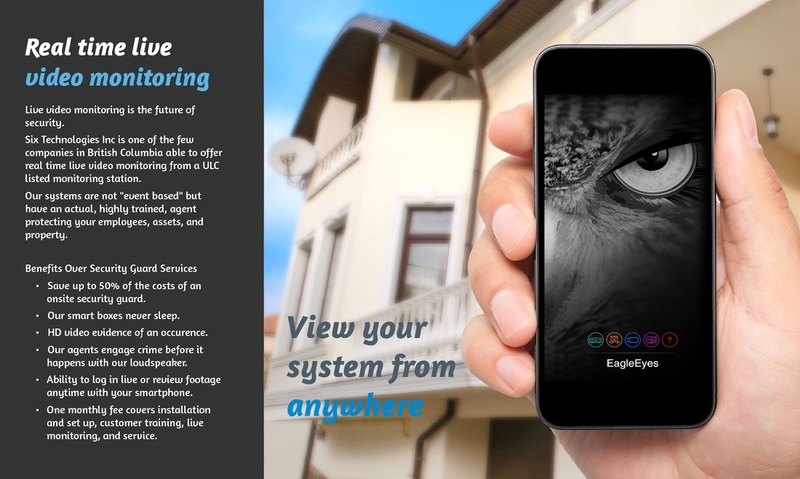 With our Eagle Eyes App you can not only view your cameras live but can review recorded footage right from your phone or tablet. When you contact our office for a hassle free security assessment, we will send out a professional to assess your property and discuss your security needs with you. We will then prepare an estimate based on our site visit and review your options with you.